TEXERE Biotech unveils the world’s first fully robotic line offering revolutionary improvements in the processing of human tissue. TEXERE Biotech, a Belgian-based biotech company specializing in human tissue processing, is today inaugurating the world’s first fully robotic, and the most advanced processing line for the production of orthobiologics bone allograft. As the source of the product is donated tissue, it is extremely important to maximize the yield in order to increase the availability to patients. The TEXERE process (known as “smart factory-industry 4.0 type”) increases tissue recovery by a factor of 2 to 3 compared with existing processes. At the same time, it offers a revolutionary improvement in product quality, with increased medical safety, and does so at a reduced cost. TEXERE Biotech (www.texerebiotech.com), which was privately founded in 2016, designs and builds forefront robotic processing lines to drive progress and innovation for recycling human tissue with proven clinical and economic value. Bone is the second most frequently transplanted tissue after blood and maximizing its availability is of key importance for patients. Musculoskeletal conditions are the second largest cause of disability, affecting the daily lives and productivity of 20 to 30% of people across the globe – and rising as life expectancy increases. Bone defects may be caused by trauma, tumors, or infection. Management of musculoskeletal conditions often requires surgical care. Surgical reconstruction of bone defects can present significant challenge for the orthopaedic/traumatology surgeon. Bone allografts are used as first line of treatment in bone revision surgery by orthopaedic, maxillofacial and dental surgeons to repair, replace, restore and regenerate bone to restore their function or alleviate pain. 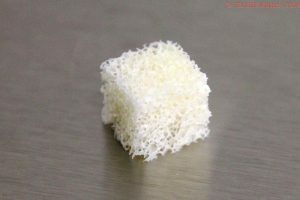 For bone grafts, bone allograft (tissue harvested from one individual and implanted into another individual) is not only considered as the second best available material after bone autograft (tissue harvested from, and implanted in the same individual) but it also comes at a fraction of the cost of artificial bone substitutes. Bone tissue used for bone allografting is usually harvested from living donors. Femoral heads are donated after total hip replacement surgery. Many of these operations are carried out worldwide (for example 1,400,000 operations/year in Europe and about 30,000 operations/year in Belgium). So, there are many potential donors of bone tissue. This first production line is being inaugurated in presence of Minister Pierre-Yves Jeholet, Vice-President of the Walloon Government, Minister of Economy, Industry, Research, Innovation, Digitalization, Employment and Training on December 12th, 2018. TEXERE Biotech (www.texerebiotech.com), incorporated in 2016, has been co-founded by three partners who have joined their various medical, industrial and robotics expertise with the vision of using advanced automated technologies (known as “smart factory-industry 4.0”) to contribute to solve today’s and future healthcare challenges: providing better access, improve outcomes, and lower overall costs of patient care to restore health and extend life for people around the world.